The Twisted Spoke plan for Zirbel. The t-shirt that saves Tom. The beginning of a Movement! We wrote two or three posts about American rider Tom Zirbel testing positive for the steroid DHEA. He may be an innocent victim of supplement contamination — those secret ingredients will kill you! It’s also possible the geeks in the white labs coats made mistakes. Guilty, not guilty, whatever. I’m now pulling for Zirbel for the simple reason that he’s not a witless, egotistical bozo like CERA fiends Di Luca and Ricco. But that’s not the story. This is about a rabid Zirbel supporter who immediately began haranguing me for what she considered my flip, cynical assumption of Zirbel’s guilt. She was fighting mad and had to get the last word, in comment after comment on my blog. Wow, Twisted Spoke had its first stalker. After exchanging a number of emails back and forth I thought we’d reached a agreement: I softened my stance on the unlikelyhood of Zirbel’s innocence and she downgraded me from despise to intensely dislike. A fair deal, I thought. However, when Zibel’s B sample came back with the same bad news and I did a follow-up post, she lashed me again. This is when I reminded her of the gift I’d given her. If she was so totally, 100%, beyond a shadow of a dope test, possibly-even-in-Zirbel’s-family-tree sure that he was innocent, I had a plan for her. 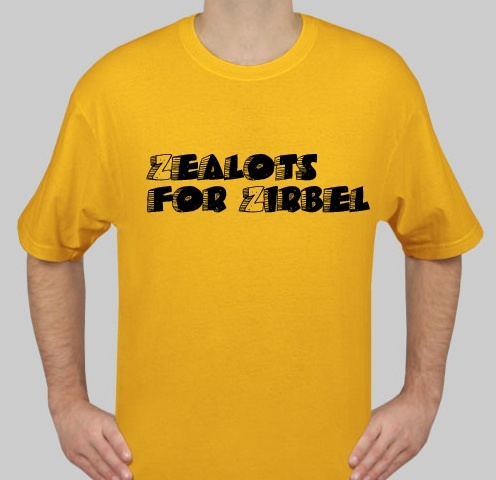 I suggested, using my 20 plus years as a slick advertising professional, that she form a fund raising group for Zirbel inspired by her own relentless support: Zealots For Zirbel. Ah, the power of simple alliteration. Now anyone in marketing knows that a good name is half the battle. I’d just handed her the kind of galvanizing war cry I used to charge corporate clients $10,000 for. She failed to see the brilliance and instead she kept on sniping. Where was her grass-roots activism, I asked myself? So I’m throwing this snazzy slogan out into the blogosphere. Assemble the Zirbel army and get their sizes. I roughed out a bare bones t-shirt design with a web template just to get their creative juices flowing. Tom’s a groovy guy and at 6′ 4, he’s the same height as me. We tall men stick together so, hey, a freebie Z-Man — and send me an XL when you’re done printing. Organize the troops, set up a bank account and don’t make the same mistakes Fairness For Floyd made. In other words, do not threaten to bring up the Greg Lemond child molestation story. Landis still hasn’t recovered from that astronomical lapse in judgement. Okay, professional consulting done. Time for you to get to work Delilah. « HTC-Columbia women’s squad opens season in Qatar. Please, no self stimulation. So… child molestation stories are out, but even if I have photos? Bite molds? Recordings? You’re ok, Mr. Walsh. And I never did intensely dislike you. I always liked your writing, just a couple of your comments ruffled me some. If you’ve really come around to Tom’s side, then Bless Your Heart.